Saving money on cheap clothing and saving money on designer clothes is possible, but requires different strategies. Saving money while shopping for cheap clothes is based on the knowledge about retail stores. Saving money while shopping for designer clothes is based around human psychology and value management. Saving money on cheap clothing is based around the knowledge how retail stores operate. Knowing the strategies retail stores use to achieve higher revenues will help to save money. “Cheap clothing” in this article is defined as mass market clothes available in the bulk of retail stores all over the world. “Cheap clothing” may not necessarily always be cheap, but it is the second cheapest option after second-hand clothes. Order is everything in the retail sector. Piles like these are where the clothes with largest discounts get placed. They’re the only places where it’s possible to find a T-shirt or a sweater with a 70% discount. Yet, few people even bother to try finding clothes in similar piles. Why is that? Humans tend to hold negative perceptions about a lack of order (1, 2), and will avoid things that aren’t sorted neatly. Therefore, the clothing piles tend to have the human psychology working against them. Moreover, finding clothes in these piles is difficult and time-consuming. However, if a shopper is seeking the biggest discounts, piles in stores shouldn’t be ignored. The clothes may be arranged in a messy manner, yet they still are of the same quality. Even better, they come with discounts that make a bit of pile diving all worth it. 2. Look at the lower shelves. This shopping strategy comes from grocery shopping hacks. Grocery stores always place cheaper products in the lower shelves. Because the human eye level is somewhere around the middle part of the shelves, few consumers buy products from the lower shelves. That happens because most of us don’t register the products placed on the lower shelves. Clothing retail stores also take advantage of this fact. However, they do it with a twist. Everyone probably has noticed that expensive clothes always get placed in the centre, and at the front of the store. If expensive clothes get placed at the forefront, then shoppers looking for cheap clothing should seek out areas far away from the centre of the store. Because that’s where the clothes with the biggest discounts will be placed. Clothing location in a store. Copyright: Money Bear Club. To use this strategy, the customer should walk around in the opposite way the store is designed to. If most customers walk around central exhibitions of the clothes, and only later view the shelves near the walls, then the opposite should be done. Meaning, the shelves near the walls should be viewed first. If most customers walk in a counter-clockwise pattern, then the shopper looking to save money should walk in a clockwise pattern. 3. Websites are there for a reason. Most shoppers looking for clothing either buy it online, or visit brick and mortar stores. Only a small percentage of shoppers first view clothes online, and later buy it at a physical location. That’s a strategy that can be used to save money on clothing. There are two factors that make this strategy perfect for saving money on clothing. The first factor is the price. When a shopper sees a price online, he or she sees it from a comfort of their home. The shopper doesn’t get swayed by the bright lights of a store, top-40 radio music or the scents of a store. This means while viewing clothes online, the methods companies use to influence in-store sales, lose their meaning. And price then starts playing a bigger role. 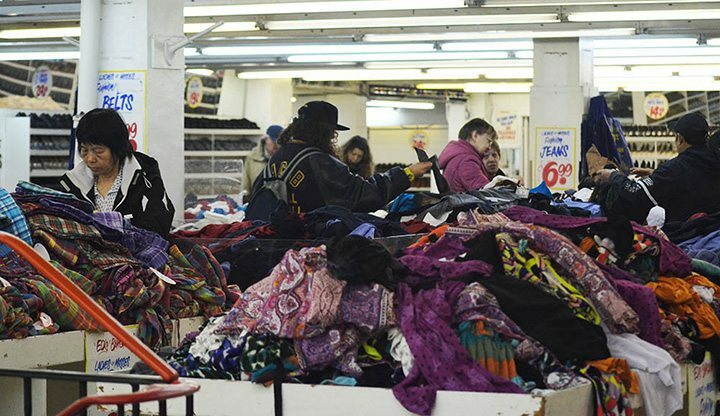 The possibility to easily sort clothes by their price is not present in physical stores. Clothes are hanged not according to their price, but by their design. Moreover, even if a customer chooses to compare items, it can’t be done comfortably. This happens because of a lack of sitting areas in clothing stores. Yet, sorting by price is very easy when shopping online. Many websites also allow to filter clothes by their qualities and by their price. This enables the customer to make fully informed comparisons. This also helps to easily factor in the price of clothes into their decision-making. The second factor is the design of a clothing store. And it’s not related to the design that discourages consumers from buying cheaper products. Clothing stores (mass market clothing stores) are designed in a way that encourages high customer turnover. High customer turnover happens when shoppers make the decision to buy clothes quickly, and leave the store even faster. Bright lights, small print on clothing labels, miniature changing cabins without a comfortable place to sit, shelves placed back-to-back to each other, discourage customers from spending more time in a store. This type of design also inadvertently (or maybe consciously) discourages customers from heavily thinking about their purchases. And that is bad news for their wallets. The design factor is not present in online shopping. When shopping from the comfort of their own homes, shoppers aren’t affected by the design of a a store. Neither the small print on clothing labels, nor the bright lights make an impact. Then, shoppers don’t feel rushed to make a decision. The biggest disadvantage of online shopping is the inability to try on clothes before buying them. However, this problem can be easily rectified. Shoppers looking for the highest savings should pick the clothes in online stores, and try them out in a physical location. This strategy gets the best of the both worlds. 4. Shopping shouldn’t be done during rush hours. That’s a simple strategy, but it can help to save money. Shopping during rush hours means having to deal with lines near changing cabins, clothing strewn around, and a more cramped shopping experience. These factors can result in shoppers making quick, rather than well-thought-out decisions. Shopping during rush hours is also characterized by clothing getting sold out. This is really bad for the customers. They get forced to either come back another day to buy the clothing they want, or to abandon their decision to buy clothing entirely. Mall of America visitor statistics. Source: Google Search. These statistics are now available for many of the world’s stores and shopping centres. 5. 2 for 1 discounts work, others not so much. The rise in online shopping has made the profit margins of brick and mortar stores smaller. Coupled with the fact that the competition in the clothing sector is increasing (1, 2), few stores can give their customers large discounts. A 70% or a 50% discount is mostly unheard of, and most discounts are now in the range of 15% to 30%. Although a 25% discount is nothing to scoff at, it still doesn’t even come close to 50% and 60% discounts. The discounts that are still worth it, are the “2 for 1” or “3 for 2”. Although they are mostly given to T-shirts and sweaters with basic designs, they are sometimes also given to more expensive clothes. This discount works better for them. Although most items given away for free are in the €5-€10 range, it’s possible to find €20 clothes given away as well. 1.Get to know a sales associate. Knowing a sales associate in a designer store is the easiest strategy to save money on designer clothes. A sales associate in a designer store can advise about sales, put away clothing upon request, and provide a wealth of information about clothes. Although becoming a regular client of a sales associate may take up some time, this will bring great savings to the client. 2. Fake second-hand. Those who are looking to buy designer clothes are certainly not looking to buy fake, second-hand, or even worse, fake second-hand clothes. However, fake second-hand can have a different meaning. Humans love new things, and they are willing to pay more for them. Designer stores take advantage of this fact, and sell new and exclusive clothing at higher prices. Yet, it’s possible to buy designer clothing at a lower price. The “fake second-hand” strategy is based around the luxury clothing resellers and the prices they offer for designer clothing. If a buyer is looking to invest in a designer piece and save money, the best course of action is waiting three to six months after a piece is released. That’s the period of time when a piece’s previous owners get bored with it, and resell it for a lower price. Or wait even more time (up to a year) and buy from resellers. Why it’s “fake” second-hand? Because these clothes don’t really qualify for the second-hand definition. Most often, they have been worn once or twice, or even never at all. Buying designer clothes from resellers is like buying new designer clothing, just with a significantly lower price tag! 3. Price adjustments. Asking for a price adjustment is one of the lesser known ways to save money on designer clothing. If a customer buys an item in the period of 1 to 2 weeks before sales, they can ask for a price adjustment. Price adjustment is the difference between the full and the discounted price paid for a designer item. By buying an item, and asking for an adjustment, the customer saves: time (spent looking for an item during sales) and worries (clothes at designer stores get sold out quickly during sales). The customer may also get a discount for buying an item outright, rather than waiting for sales. The menswear segment and its sales strategies are completely different from the segment of women’s clothing. As men buy goods and perceive prices in a way that is different from women (1, 2, 3), saving money on menswear also uses different strategies. 1.”One fits all” approach does not work. To put it simply, male clothing buyers tend to favour quality of clothes over quantity. A classic style coat becomes good enough both for running errands, and for meeting important clients. These three coats are all in the casual to business casual category. Yet, only the last coat fits both casual and business events. The money that is saved on purchasing a second, more official coat or a jacket, is lost in terms of social acceptance. Although casual wear can be seen in many official spaces, those who wear casual clothes there still aren’t regarded seriously. It’s enough to have one coat that falls into the category of classical coats. It will look a bit out-of-place in a casual event, but not by much. However, a casual coat won’t command respect and attention in a professional event. 2.Grab and go still works well. Most men don’t like spending more time shopping than it is necessary. The most popular shopping strategy among men is the “Grab and go”. The first clothing item that satisfies their requirements is good enough to buy it. This strategy works really well for mass market clothing stores. There, the prices don’t differ that much, and the time saved while shopping, can be used for more valuable pursuits instead. Men should be aware of the limitations of this strategy. In expensive clothing stores, just grabbing an item does not work as a strategy. Not comparing it with other similar items could mean overpaying by as much 2 times. The two suits below look identical. Apart from the collars, they are almost completely the same. Yet, their price difference is £547! They’re from the same designer and are in the same colour. One of the suits still manages to cost £500 more than the other. If a shopper were to use the “Grab and go” strategy for these suits, it could have backfired immensely. For more expensive clothing items, such as suits or jackets, male shoppers should consider not using the “Grab and go” strategy. 3.Advertising can make a dent in the savings. Most consumers like to think they are immune to advertising. That is, sadly, not true. In-store advertising can be particularly effective on men. Most menswear stores feature rugged men enjoying outdoor activities, or businessmen in their formal suits. Although many men fit into these categories, or aspire to do so, for others, this type of advertising preys on their personal opinions. An office worker with no time to go out and travel, will respect those who make time for travelling and exploring. A student with aspirations in business, will have positive opinions about those who already have a business. When these men go out and shop for clothes, the pictures and in-store advertising will make an impact on their shopping choices. The shoppers may spend more, or buy clothing that won’t be worn. That’s why it’s important to acknowledge that advertising is a powerful tool. Advertising, in this case, is a tool that can harm the financial situation of a shopper. The strategies and methods presented in this article may not fit customers in all countries in the world. Buying clothing in a bazaar requires a completely different mindset than shopping in a shopping centre. Fast fashion and extremely cheap, mass produced clothes, have enabled people to buy more, and throw out more clothes than ever before. This can seem like the new normal, yet without the labour power of developing countries this would be impossible. Thus, when saving money on already cheap clothing, consumers should examine the practices and the ethics of the clothing stores.